I just had one of those mornings we don't like to talk about much. 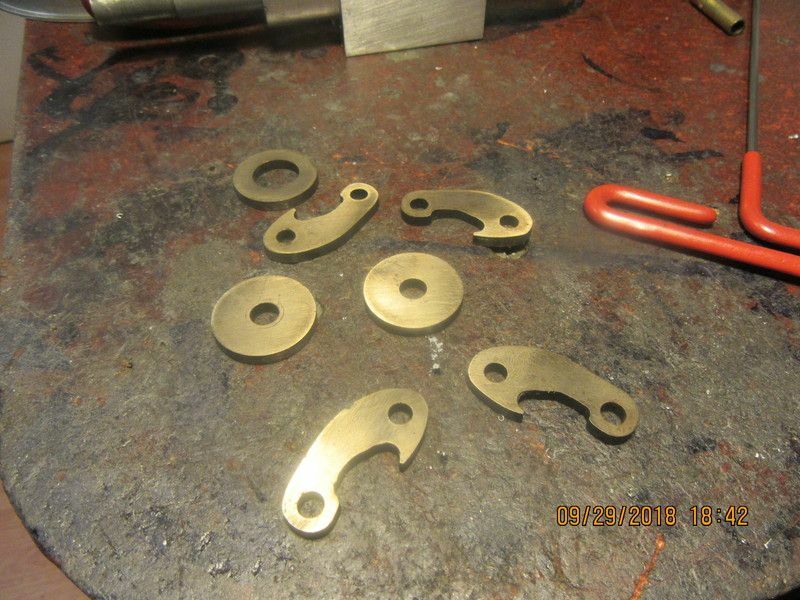 After fully assembling all the clutch pieces, I seen that one of the 01 steel washers could be shaved thinner to make things work better. So I did--and then it wouldn't work at all. So--I got to make a brand new washer from 01. Then I noticed that the bushing which the sliding cone slides on could be made 3/16" shorter to make a more compact package, so I did---and then it wouldn't work at all. So---I got to make a brand new 01 steel bushing. I hope I don't see anything else that needs improving!!! 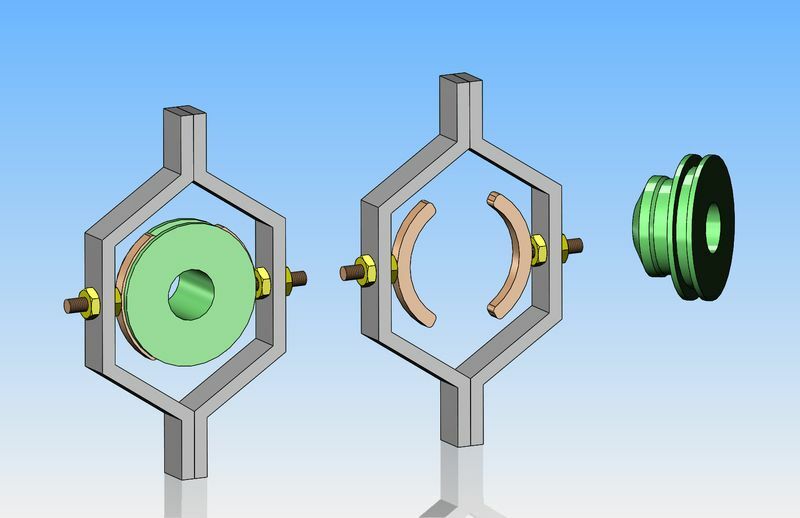 I may make the flywheel this afternoon, and I still have to harden all of the 01 steel pieces. I wish I had made that sliding cone out of 01, but I didn't have any 01 that size. I might ask a local shop about case hardening it. So--If I had my friction material, we're ready to rock and roll. Since there is no way to show inanimate pictures and tell people "it works", I will be rigging a drive and a clutch handle and setting up a live performance I can take a video of. I've had a revelation this afternoon!! My back was getting sore from standing at the lathe, so I decided to do a bit more studying on clutches, looking at dragsaw videos. When I made the dog clutch on my drag saw, the sliding portion of the dog clutch was moved by two 3/16" diameter pins thru the clutch handle as shown in the first picture. It worked, but I thought that the minimal contact between the round pins and the slot in the sliding cone would probably have been a problem. Today, I replayed all the YouTube dragsaw videos, and SHAZAM!! !--I seen that on the full size machine, there were actually two bronze crescents that fit into the groove on the sliding cone.--See second picture. Damn!!! Learn something new every day!!! Nice catch! On the dog clutch for the track drive on the marion shovel, it used a full ring rather than the two crescents, but same idea. Gotta go back and look at the pictures to see how they assembled that...! I can get very close to what was originally designed by cutting the blue inserts from bronze, soldering on stub shafts, and using a piece of 2 1/2" std. pipe to form the outer housing. Not really sure that I want t go to all that bother, but maybe. A lot depends on how well I can silver solder onto bronze. 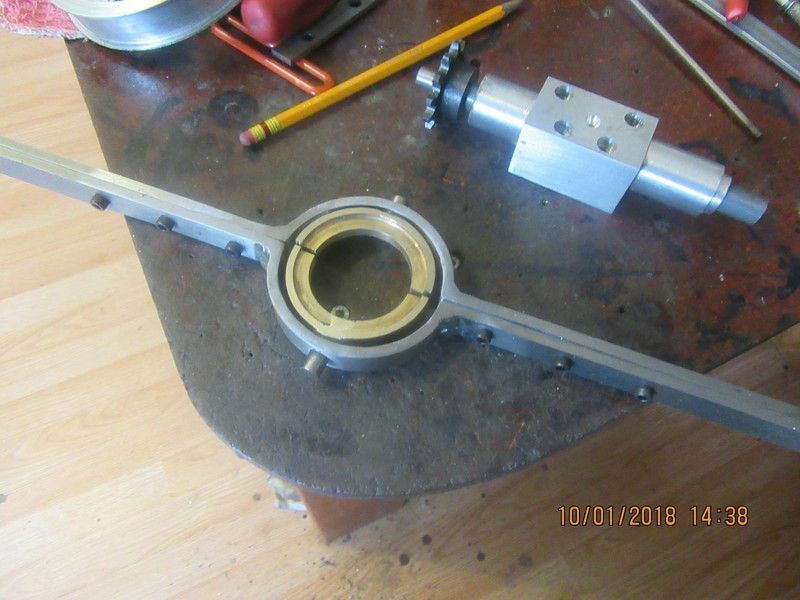 Found pics of the one on the Marion - they also did it in two halves like you show, they meet at the ends and have a bolted flange to form the full circle inside the groove. Never noticed that, may have when I went to make it (maybe). Oh yeah baby--I had some brass or bronze, (I don't know which and for what I'm doing it doesn't matter). Now I'm off to see a friend who will send my sliding cone out with some of his stuff to get case hardened. All of my clutches 01 steel parts have been heated to orange/red, quenched in oil, and then baked in good wife's oven for 2 1/2 hours at 350 degrees. The heating and quenching makes them diamond hard, but very brittle. The oven heat soak leaved them hard but takes away the brittleness. 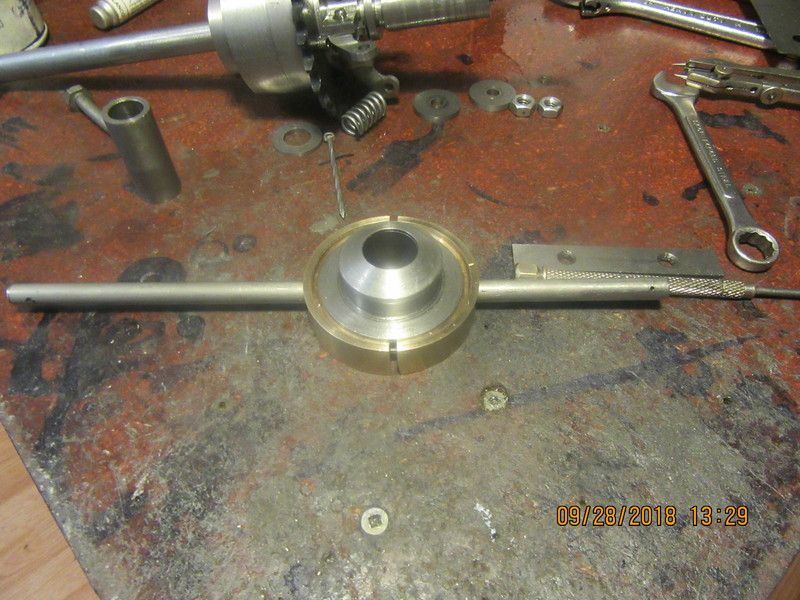 The cone part of the clutch, which was made from mild steel has been sent out for case hardening. The bushing which fits between the cone and the shaft is also made from 01 steel, and has been heated, quenched, and tempered. It is not in the picture, because the surface finish was SO UGLY that I am ashamed to show it. On my very last pass on the o.d. I didn't retract the cutting tool before backing it away from the chuck, and it left a spiral gouge full length of the bushing. There wasn't enough material left to do a clean-up pass without going undersize. I dressed it with 200 grit carborundum strip paper, which takes off only about half a thou but cleans up a lot of the minor tooling marks, but the spiral gouge is still there. 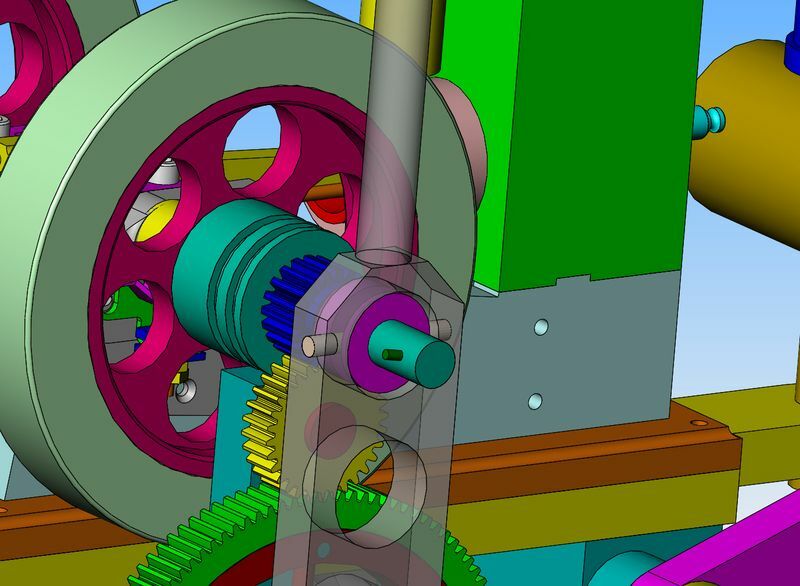 It won't affect anything, and will in fact act to retain some lubrication between the outer diameter of the bushing and the steel cone which slides on it, but it looks really nasty. Once everything is assembled it won't be visible. Today I'm reduced to "farting around". Can't do much on the clutch assembly until I get the friction material and the part I sent out for case hardening back. I did accomplish one thing--a close examination of that big 8" wobbly v-belt pulley that I've used on numerous set-ups showed that two of the spokes were broken, so I went down to Canadian Tire and bought a new pulley and a couple of cheapo 1/2" dia. pillow block bearings. I modelled them this afternoon for something to do. The actual test set-up for video is going to look like this. I have reached the "Can't do anymore" point. I have to wait now for my friction material and my case hardened expander cone. This is the mechanism which operates the clutch. The ends of the flatbar are left untrimmed for now, until I assemble everything. This will be (more or less) the set-up for testing the clutch. 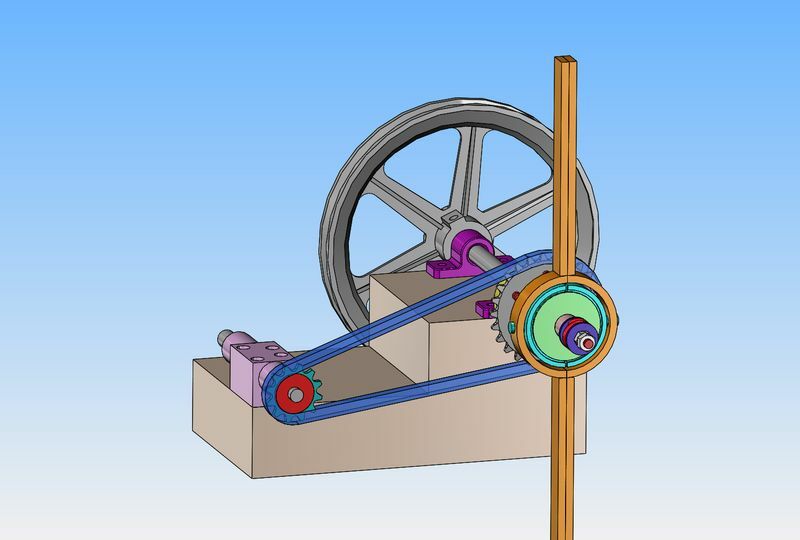 An electric motor is going to drive the large pulley via a v-belt. 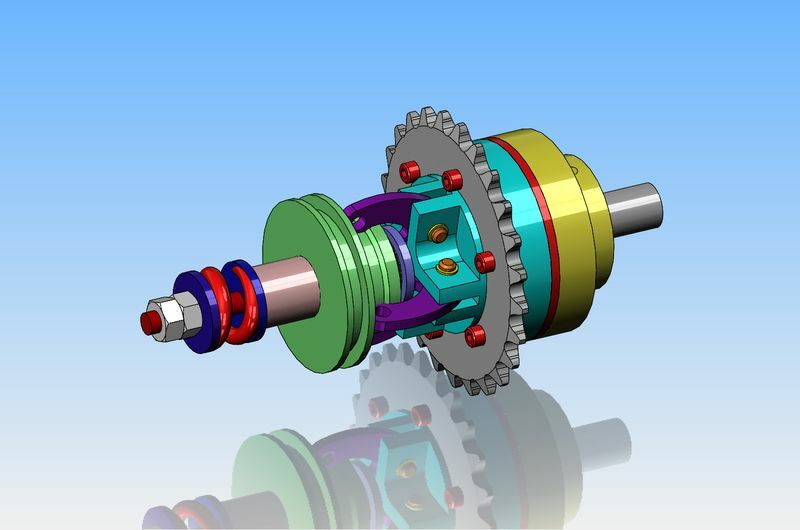 The sprocket which is bolted to the driven hub of the clutch will drive a second smaller sprocket when the clutch is engaged, thru a #35 pitch roller chain. In order for a clutch like this to function properly, there has to be some resistance to turning. 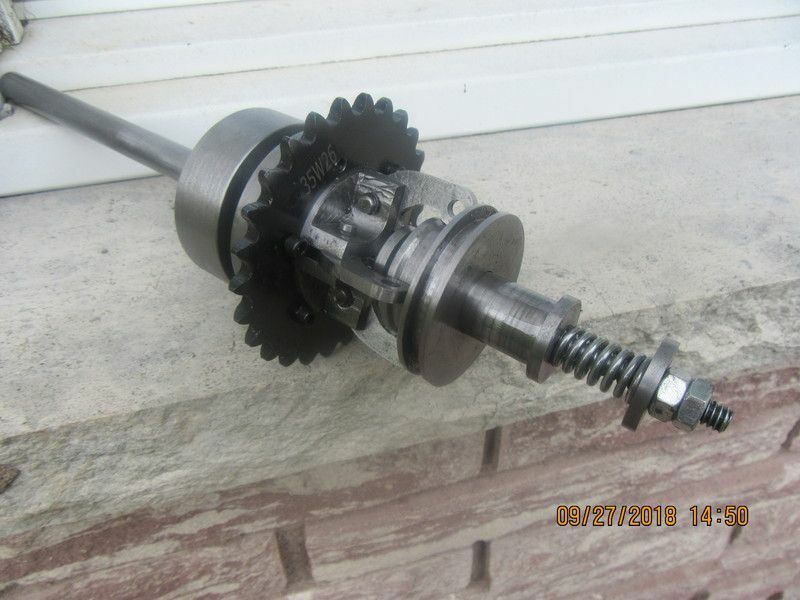 If there is no resistance to turning, then just the fact that the clutch sprocket is setting on a revolving shaft will make the sprocket turn also. 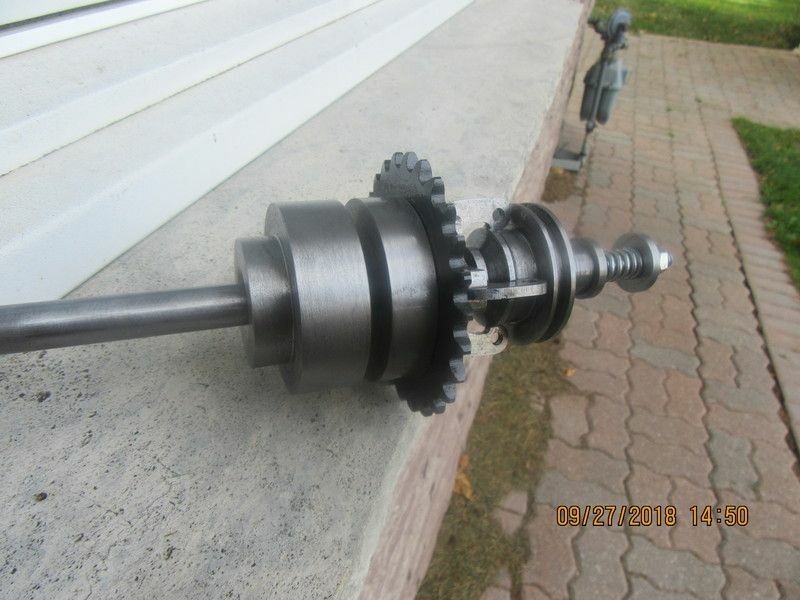 The resistance in this case will be provided by a nylon pellet under a #10-24 set screw thru the side of the small sprocket shaft housing. 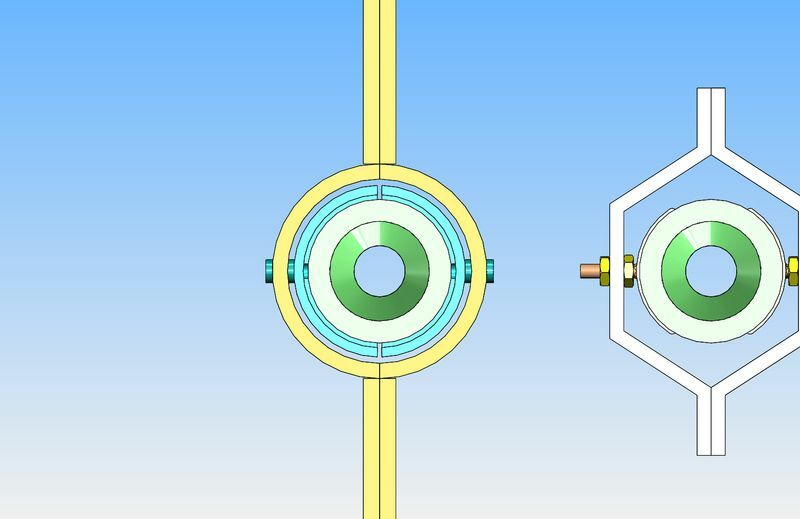 I will be able to vary the resistance to turning by tightening down the set screw against the shaft which carries the small sprocket. And now we are in "wait mode". 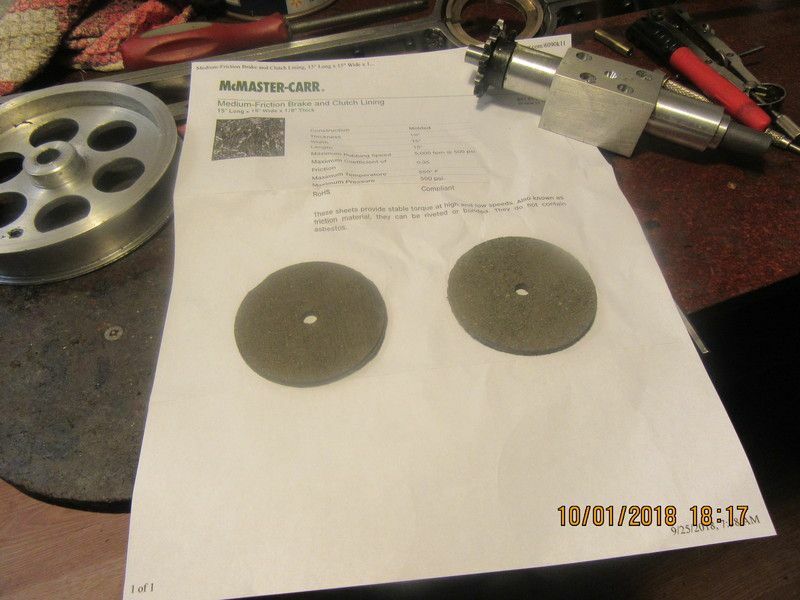 I can't do anymore until my case hardened expander hub comes back from case hardening.--And I can't call the guy and hurry him along, because its being done as a "favour". 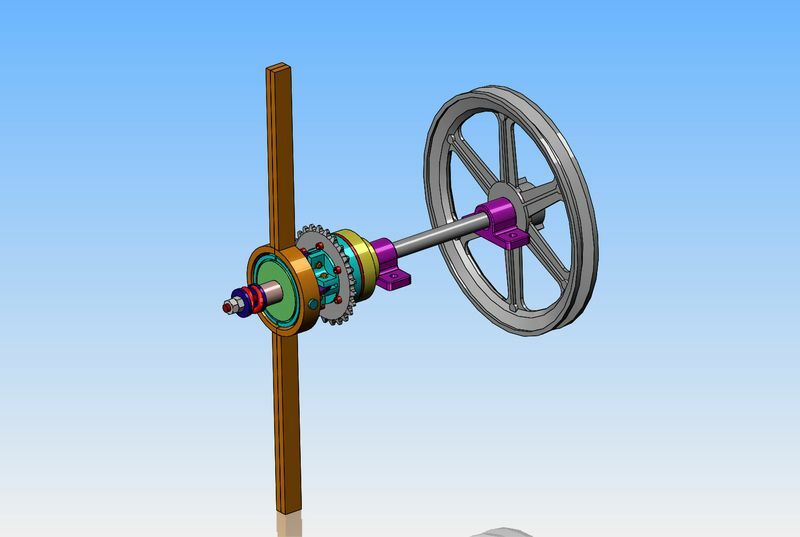 The set-up as shown lets the shaft revolve freely without turning the sprocket. 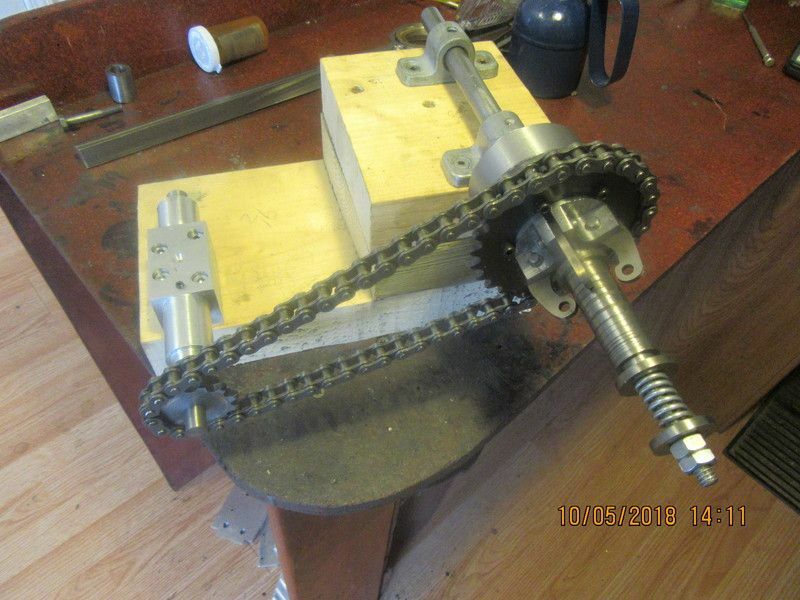 it also lets the sprockets and chain revolve freely without rotating the shaft. I may have to adjust the width of the wooden stand, but won't know until the expander hub is installed and anchored in the correct place.